Recent advances in Internet technologies, combined with a society that relies upon them, have brought about a new toolset for working and sharing on the World Wide Web. The term “Web 2.0” suggests an updated version of the Web, but really names a new genre of web applications, along with the technologies they rely on and the social content contain. Web 2.0 marks the evolution from a “one-way” Web filled with static content to a dynamic “read/write” Web that has become a platform promoting collaboration and communication, linking people as well as the digital information they share. This chapter applies a connectivist learning approach to creating authentic learning spaces for teaching Web 2.0 concepts in a first-year college information technology course. 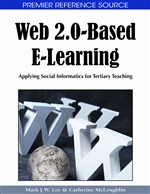 It suggests best practices for fostering learning by using Web 2.0 tools to create connections with people, ideas, and technology. Siemens (2005) defines connectivist learning as learning “driven by the understanding that decisions are based on rapidly altering foundations. New information is continually being acquired” (p. 7). It is important to be able to distinguish between what is important and what is not, and understand how changes in information and technology may impact earlier learning and decisions. These are precisely the skills required of tomorrow’s knowledge workers. The culture of participation fostered in a rapidly changing Web 2.0-oriented environment supports such a style of learning required in this digital age. Siemens (2006b) states that a decentralization of knowledge contributes to the enrichment of learning, giving more control to the end-user, so that learning becomes a process of gathering, adapting, and creating knowledge. This results in a challenge to authority, a need to be connected, and ultimately a desire to be able to make change. To fill this gap, Siemens proposes the theory of connectivism, which views learning as occurring in the process of creating connections between new ideas and experiences, an idea that is consistent with and appropriate in a Web 2.0 world. Knowledge may reside in non-human appliances, and learning is enabled / facilitated by technology. Currency (accurate, up-to-date knowledge) is the intent of all activities.